The spotlight this week is on the Tall Timbers subdivision in Algiers. Bounded by General de Gaulle, Woodland Drive and the Intracoastal Waterway, the Tall Timbers neighborhood has much to offer home owners. Located only 3 miles from the Crescent City Connection, 6 miles from downtown New Orleans and less than one mile from University of Holy Cross, living in Tall Timbers comes with multiple benefits. The Collins Park Bird Sanctuary is located near the middle of Tall Timbers subdivision, next door to Eisenhower school. A peaceful respite sponsored by the Tall Timbers Garden Club. Small pocket areas of specialty housing are sprinkled throughout the subdivision limits. Tall Timbers Estates is made up of 5 streets (Inwood, Pin Oak, Post Oak, White Oak and North Teak) and features larger, custom built homes. Woodstone consists of one circular street within the community with the largest of the custom homes in the subdivision. Within Tall Timbers, there is also a collection of 14 homes that all back up to a shared pool and outdoor entertaining area. With an additional homeowner fee of $960 annually for pool maintenance, landscaping and playground equipment upkeep, this is almost a “secret” subdivision, since the private pool and play facilities are not viewable from any of the surrounding streets. 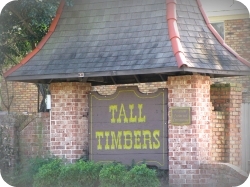 For more information on buying or selling a Tall Timbers home, please call us at 504-327-5303.